The Teacher’s Corner this month is all about online learning. This week, we will define terms common in the field of online learning and investigate the pros and cons of using online learning as part of our classroom practice. Over the last few years the field of language teaching has embraced teaching and learning online. Online learning, it was thought, would motivate and engage language learners by allowing them to learn whenever, and wherever they wanted. However, as with all new trends in education, online learning has not delivered a perfect learning context outside of the classroom. Online learning, like all methods and practices in education, needs to be balanced with student needs, technology resources, and the teacher’s classroom goals in order to create an effective learning environment. Creating an effective learning environment online is similar in many ways to creating an effective classroom environment and good design is key. By designing our materials and activities to take advantage of the digital space we can better equip our students to become self-directed learners. Yet, if completely online learning is not the goal we can still maximize its benefits when it comes to blending face-to-face and online learning. In this month’s Teacher’s Corner, we will investigate online learning and explore the advantages and disadvantages of teaching and learning online. We will also sort through the available approaches to learning online, specifically online learning, blended learning, and the flipped classroom model. Each has their own strengths and weakness that will be covered this month. Included with each of these approaches will be design considerations and tools we can use to maximize the benefits of online teaching and learning. To start this month’s Teacher’s Corner we will investigate the opportunities and pitfalls of online learning. By reviewing the literature on online learning, we can better understand how to implement it in our own teaching contexts. This week we will define terms common in the field of online learning and investigate the pros and cons of using online learning as part of our classroom practice. The discussion around online learning is troubled by a lack of a clear definition of online learning. Learning through Internet-based tools can take a variety of forms and it has at different times been referred to as Internet learning, distance learning, Web-based learning, and distributed learning. Means, Toyama, Murphy, Bakia and Jones (2009) define online learning as “learning that takes place partially or entirely over the Internet” (p. 9), a broad definition which highlights one of the challenges of online teaching and learning: it can take many forms. This broad definition provides teachers the flexibility to customize online learning to almost any pedagogical approach they would like to take. Means, Toyama, Murphy, Bakia and Jones’ (2009) definition makes no difference between learning that occurs entirely online versus partially online. However, researchers have begun to separate online learning into two broad categories: online learning and blended learning. In online learning (sometimes called distance learning), all of the course activity takes place online with little direct interaction between the teacher and students. It is often considered a form of self-study and massively open online courses (MOOCs) are a great example of this approach. Students will visit a website to watch videos, take quizzes, and engage in discussion boards with minimal teacher interaction. In blended learning, students will often have a classroom component that is supported by Internet-based materials. These materials will often be selected for their ability to expand upon the material covered in class and clarify the ideas presented by the teacher. Both online and blended learning can occur synchronously or asynchronously. In synchronous online learning, the teacher and students meet at arranged times and learn in real time, often communicating through live video or chat applications. In an asynchronous online environment, no real-time communication occurs. However the teacher and students communicate through emails, online discussion boards, or blog postings. The best approach for your teaching context should be determined by your student population. Small class sizes with a localized population can make effective use of synchronous online material, while teachers with larger classes or classes with students in different time zones should consider building a course designed for asynchronous communication. Over the last decade, much of the research interest in online learning has been centered on MOOCs. These courses initially showed the promise of delivering wide-spread education to tens thousands of learners around the world all sharing the same learning space. However, the power of MOOCs has diminished in recent years, and new research suggests they are troubled by low engagement and completion rates. Stein (2013) reports that course completion rates for MOOCs average 4%, and only half of all students who register complete the first assignment. These large MOOC-style courses appear to work well for highly motivated, self-directed learners, but for many students these courses appear to lack the social component of the face-to-face classroom. How does a teacher develop engaging online materials that fulfill the above criteria? This month’s Teacher’s Corner will offer suggestions to make the most of online learning for your classroom. Each week of this month’s Teacher’s Corner we will examine the background of the three most common ways to bring online learning into your classroom: fully online, blended learning, and a flipped classroom. We’ll also introduce digital tools that you can use to make your online learning space engaging and motivating for your students. Conole, G. (2013). Designing for learning in an open world. New York, N.Y.: Springer. Flesvig Bruland, N. (2013). Examining the relationship between interaction and linguistic outcomes: Is the online learning environment a viable alternative to traditional classroom instruction for beginning language learners? (Doctoral dissertation). Stein, K. (Dec. 5, 2013). Few Active Users, With Only a Few Persisting to Course End. Online learning presents unique opportunities for language learners. The creation of the Internet has allowed for students around the world to access authentic language learning materials regardless of physical location. More recently the move toward Internet 2.0, or social sharing over the Internet, has made it possible for English learners to engage with native speakers across a wide array of tools and websites. In this world of effectively limitless authentic English language material, the role of the teacher may seem diminished. Yet, the sheer amount of content now available online makes the role of the teacher more necessary. While students can access a wide array of language materials on their own, they still need guidance and support as to which materials can best assist them in their learning goals. In this new era of always available English language content, the teacher can serve as guide and facilitator to direct students toward content that can best serve their learning needs. This week’s Teacher’s Corner highlights a few options we can use to work with students in the online learning space. First, we’ll explore options for pre-existing online learning material. The websites featured offer Massive Open Online Courses (MOOCs) on a wide array of topics which provide students opportunities to learn new content and subject matter in English. Next, we investigate options for building your own online courses. Building an online course takes time but can be beneficial by providing students a single website where they can access English language learning material relevant to their level, needs, and abilities. Massive Open Online Courses can be a great option for highly motivated, self-directed learners in your class. These students can benefit from the MOOC philosophy of discovering courses and dedicating the time required to seeing them through to completion. MOOCs cover a diverse array of subjects so students are sure to find a topic interesting to them. However, these MOOCs are often designed for native speakers of English, so the language can be advanced. There are a variety of ways to incorporate MOOCs into your classroom practice. A great place to start is by searching for MOOCs that are similar in content and objectives to your class. The MOOC material can then be used to supplement the material in your own teaching practice. The videos found in MOOCs are usually of high quality, featuring graphics, diagrams, or subtitles to help learners better understand the content of the MOOC. These videos can be a great supplement to the textbook readings in your own class. Another option is to have students join a MOOC and take it together. Having this face-to-face community can help students succeed in the MOOC by giving them opportunities to discuss MOOC content with their peers. This could be done in a flipped classroom approach where students interact with the MOOC videos and readings at home and do the MOOC’s required homework in the classroom. For more on the flipped classroom model, see Week 4 of this month’s Teacher’s Corner. Finding the right MOOC for your students can be a challenge, but the four websites below are a great place to start your search. Each offers a large selection of MOOCs on a variety of topics. Be sure to explore each and take try a few MOOC courses yourself before introducing them in your classroom. Khan Academy – Khan Academy has perhaps the least number of courses available, but the site is often noted for the depth of learning in its courses. Khan Academy has no specific language learning classes, but it does offer test prep courses for students who may be interested in applying to university in the U.S.
Future Learn – Future Learn hosts a wide assortment of English classes that range from specific skills, such as university-level academic writing, to cultural classes that focus on specific material, such as Shakespearean plays. Future Learn’s courses usually have a specific start and end date but also list the expected hours per week that the class requires which can help students plan their course choices. Coursera – Coursera has begun specializing in content made for specific universities, but you can still find general education courses on this website. The site does feature English language courses ranging from general skills, such as grammar and pronunciation, to specific skills, such as academic writing. EdX – EdX features a selection of English language courses that are accessible to intermediate or higher language learners. These courses are often self-paced, meaning they have no official start or end date, so students can learn at their own pace. Unlike MOOCs, which are open to everyone, Learning Management Systems (LMS) are online courses built and run by individual teachers or schools. One way to think about the two is that MOOCs are something we learn from and LMS are something we learn with. MOOCs provide content for learning while an LMS is a place for teachers to host their own content. LMS allow teachers to host online content for specific classes or student populations. These systems provide teachers an online space where they can collect and store content for students. This can give the class a more organized structure as students can have content delivered to them as opposed to students needing to search the Internet for materials. LMS also have the added benefit of providing the class with discussion boards, wikis (collaboratively-built websites), and glossaries where students can further develop their language skills through targeted language practice. When using an LMS in your classroom, it is best to consider it the structural support for your class. It provides you and the students a central meeting place to read materials, check homework assignments, and organize the course. Most LMS are organized by weeks with each week hosting the material that will be covered in class. This reduces the need for paper handouts that students may lose and can help them keep track of when assignments are due. The following LMS suggestions are free-to-use for students and teachers. The first two options are server-based and require more set-up and maintenance time. Each, however, has an active community of users who are able and eager to help in the set-up process. The last two options are web-based and can be used immediately after a sign-up process. However, each has a more standardized appearance and fewer options for customization. Explore each to discover what each can do and which provides the best fit for your classroom. Moodle - Moodle is one of the largest, most established LMS platforms. It is open source, and a community of teachers and learners actively supports its development. As a result, it features the largest selection of tools for an LMS program. By using plug-ins (small bits of software that change larger software) that can be added to the basic site, Moodle can be customized to any learning context. Sakai – The Sakai platform is another open source LMS. It features a wide assortment of tools for the online learning classroom including: chat functionality, a gradebook, test creation capabilities, and wikis. Schoology – Schoology is different than Moodle or Sakai in that individuals can have free accounts, but schools or institutions must pay for the service. At the individual account level, Schoology provides the basic services of an LMS, such as the ability to post documents, share audio or video, and create discussion boards for students. Canvas – Canvas is a web-based LMS similar to Schoology that contains many of the same features as the other leading LMS. Canvas provides online platforms for classes through its website, so there is no need to set up and install the LMS on your own server as is the case with Moodle and Sakai. Online learning takes many forms, and perhaps one of the most accessible and easiest to incorporate into classroom practice is blended learning. Blended learning can be the best of both worlds as it allows face-to-face interaction and access to online resources to help students understand material presented in class. Fully online classes can suffer from students feeling isolated and unmotivated by a lack of a community of learners. Blended learning helps to reduce this issue by giving the students classroom time with a teacher and learner whether physical or through synchronous online video sessions. This helps to create what Garrison and Kanuka (2004) call a community of inquiry. A community of inquiry gives students the structure they need to process the enormous amount of content they can find online. In these communities students are able to reflect on material they find online and incorporate what they learn from these materials into classroom materials, providing a form of scaffolding. The goal of blended learning is to encourage students to link life experiences to what they have learned, ask questions, and develop self-motivation to become independent learners. Creating a blended classroom takes planning and preparation, but with the right tools, opportunities for student inquiry are plentiful. The tools listed below are great ways to add a blended learning component to your class. After each set of tools, suggestions are made for how to use these tools in a specific activity. These activities are just a few suggestions, so be sure to share your ideas with us on the new American English for Educators Facebook page! Google Drive – Google Drive allows for the online storing of a variety of documents and media. Unlike the other storage options listed below, Google Drive allows files to be opened by multiple users simultaneously. This allows for opportunities to engage in collaborative writing exercises by working on the same document from separate computers. Dropbox – Dropbox is an online file hosting service. You can create a folder with the name of a specific class and share the folder with students of that particular class. Your students can then add homework and assignments to the folder, which are automatically updated as changes are made. Box – Box has much the same functionality as Dropbox but has more limited features. Folders can be created and shared, allowing students to upload class materials to a shared space. While Box does support individual user accounts, its primary focus is large organizations, so much of its services are focused on universities or businesses. The goal of this activity is to get students aware of the language and grammar used in the world around them while providing in-class support to understand its use. Using the cameras on their cell phones, students take pictures of signs, posters, or advertisements that feature English. Students can then upload these images to your preferred online storage tool. Then before class, you can then look through the images and choose the most interesting ones to discuss in class. As a warm-up at the beginning of class, show an image, and with the class investigate the grammar and how it is being used. More advanced students can look for signs, posters, or advertisements in the community that feature incorrect or misused English. 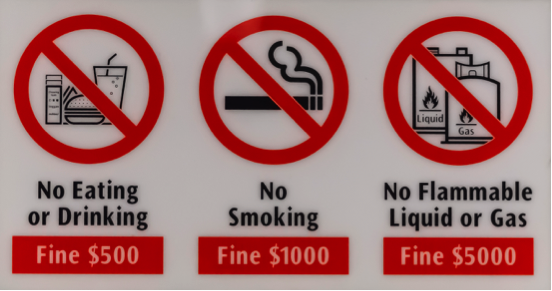 In this sign items are banned and students may expect modals of prohibition such as “You must not smoke here”. However, the signs use gerunds. The students can then work together to hypothesize why it is correct to use a gerund in this situation. The goal of this activity is for students to work as a community of inquiry and notice grammar and how it is used in everyday life. By bringing in images the students have taken, you can get students to develop an awareness of how English is used in daily life and empower them to be active participants in their own learning. Having students read and peer edit or review each other’s writing helps both writer and reader. However, students can often be reluctant to provide feedback that they consider critical in a face-to-face classroom setting. Classroom peer review sessions can be moved online to give students more anonymity when doing peer editing and review activities. Have students complete class-writing assignments and upload them to an online storage tool. You can then make copies of the students writing assignment. In these copies, remove the student’s names and other personal information. Then, assign each student a new paper to review and edit. Nearpod – Nearpod allows you to create PowerPoint-style presentations that can be shared to each student’s own device. Students visit the webpage and input a unique code you provide and can then watch your presentation. A great benefit of this software is that, by using their own devices, students are able to interact with your presentation through a variety of activities such as exploring maps, answering questions, or watching videos. Poll Everywhere – Poll Everywhere enables you to create polls that students can answer via the Poll Everywhere website or by text message. As students respond, their answers are displayed in real time via a central screen such as the classroom projection screen. Poll Everywhere has recently added a PowerPoint add-on that allows for polls to be inserted into any PowerPoint presentation. Plickers – Plickers works through the use of printed QR codes that you give to students. During class, you can ask multiple-choice questions which students answer by holding up the cards with the correct symbol. You can then scan the classroom via a smartphone app. The app reads the QR code each student is holding to determine each student’s answer and then reports the results. Kahoot – Kahoot takes the multiple-choice test and turns it into a classroom activity. Teachers create multiple-choice questions prior to class. In class, students can use a computer or smartphone to log into the game. On their screens, students see four answer choices, and they choose the best answer to the question that is displayed on the teacher’s screen.. After each question, the teacher’s screen will display the results including the number of correct and incorrect answers. Engagement tools and polling software can be a great alternative to paper-based quizzes to gauge student understanding of material. With these tools, you can pose questions to your class. Students can then answer as a class, in small groups/pairs, or individually. A benefit of using these types of online tools is that they allow students to determine their own understanding of the material instead of comparing themselves with the rest of the class. Students are able to track their own answer to each question. After each question, the answer is displayed on the screen for all the students to see. The ratio of student answers to each possible question is also displayed, allowing the class to see the correct answer and which answer was most commonly selected. When using this type of software, be sure to allocate time to analyze the students’ answers as a whole class exercise. This can provide both you and the students insight into which material they are finding the most challenging or which material they have mastered. Multiple-choice tests are used for assessment of individual students but can also be used as a collaborative activity and allow for more immediate feedback on results. Using one of the tools above, try giving students a multiple-choice test. After each question, take time to evaluate the students’ answers. If most of the class got the question wrong, stop and review the material by engaging in class discussions or small activities around that specific question. This gives students the opportunity to understand what mistakes they made and why. For the teacher, it provides an overview of how many students understand the material, what material is understood, and where more practice needs to be focused. Polling software can be used in class to let students ask questions anonymously. Stopping for individual questions in large classes can be time consuming. Also, weaker students may be reluctant to ask questions on material they do not understand. Polling software can be used to allow students to ask questions as they occur, but the questions are recorded and saved to a question bank. At the end of the class or at the start of the next class, the questions that have been posted to the question bank can be reviewed and answered. This month’s Teacher’s Corner has outlined ways to approach teaching and learning online. These approaches have focused on not only fully Internet-based approaches in online learning but also a mix of classroom practice and online resources known as blended or hybrid learning. In this week’s Teacher’s Corner, we will examine a form of blended learning known as the flipped classroom model and look at the tools needed to help build a flipped classroom. The flipped classroom model is based on the ideas of active learning. In active learning, students are encouraged to move from being passive participants, such as only listening to a lecture, to taking more ownership over their own learning. An active classroom approach has students engage in activities such as group projects, class presentations or debates, or worksheet-style assignments but in small groups or pairs. The goal of the active language classroom is for students to be continually engaged in using the language. The challenge to this is in providing the class time for students to be active while balancing the need for explanations of grammar, vocabulary, and other aspects of the language. This is where the flipped classroom approach can help. In a traditional classroom practice, students are taught new material in class and then are expected to practice and improve upon that material through homework, at home. This new material is often provided through direct instruction in teacher-led activities such as lectures, class readings, or even quizzes and tests. Outside of the classroom, students are expected to do homework activities such as completing worksheets, writing paragraphs, or practicing vocabulary to reinforce their knowledge of the material. The flipped classroom approach uses Internet-based tools to change, or flip, this classroom model. In the flipped classroom, students are first introduced to material at home over the Internet by watching lectures, completing readings, or even taking quizzes or tests online. Students then come to class with the knowledge of the material and use class time to complete typical homework-style activities. This allows students to work on new material while having the teacher and fellow students as resources with whom they can share ideas, practice communication, or find answers to questions. Flipping the classroom requires planning and preparation to maximize its effectiveness. As the instructor, it is critical to have a clear outline of the course and the objectives for each day. With these objectives set, you can begin creating content for students to study at home. Having the right tools is key to creating engaging content for students. The list of software and websites below is not a complete list as there are many options available for creating online learning content; therefore be sure to identify which tools work best for you and your teaching context. Finally, remember that creating content can be time-consuming at the beginning, but once the videos, audio recording, or presentations are made, they can be reused for later classes. YouTube – YouTube is one of the largest video hosting services. After creating an account, you can post videos that can then be added to websites or course management systems. Videos hosted on YouTube can be made private so that they are only available to those who have the weblink. Camtasia ­– Camtasia is a professional-level screen capture and video editing software. Users can create screen recordings, make edits, and add images or audio. However, it must be purchased. Open Broadcasting System (OBS) – OBS is a livestreaming and recording software. Free and open source, OBS allows you to stream your computer screen directly to websites such as Twitch, Youtube, or Dailymotion or make a recording that is saved as a movie file. Quicktime – Quicktime comes installed on every Mac. It can be used to create audio, video, or screen recordings. Screencast-o-Matic – Screencast-o-Matic has both a free and paid version. The free version allows for recordings of up to 15 minutes; however the screencast-o-matic logo is added to the video. PowerPoint – PowerPoint is frequent in live classrooms but can also be used to create video versions of presentations. Make your presentation, add audio, and then export it to a video format for posting online. Prezi – Prezi is an example of what is known as ‘freemium’ software. It has a free version with limited functionality and another version with more advanced features that requires a subscription. With Prezi, you can create presentations that are less linear than PowerPoint, allowing you to make more story-centric presentations. Strut – Strut is a web-based presentation program that is a mix of PowerPoint’s linear design and Prezi’s animation style. It is a free to use online program that is easy to learn for people familiar with PowerPoint. Audacity – Audacity is an audio recording and editing software that allows for the creation of recordings that can be added to presentations or movies. It exports recordings into .mp3 files which are compatible with all presentation or video recording software. Ardour – Ardour can take time to learn but comes with a sophisticated set of tools for recording layered tracks such as musical performances. The complexity of Ardour comes from its ability to connect with a range of musical instruments. Wavosaur – Wavosaur has much of the same functionality as Audacity for making recordings in a variety of formats such as .mp3 and .wav files. It’s simple user interface is a good place for learning how to record and edit audio files. Cell Phone – Sometimes simple is best, and most cell phones have an audio recording function. It’s easy to record directly to your phone and then export it via email, an online storage service, or messaging service. Creating a flipped classroom begins with rethinking traditional classroom practice. A traditional classroom approach focuses on content delivery, such as explaining grammar rules to students or giving a lecture. These approaches place students in a passive role, while a flipped classroom is designed around active learning. In active learning approaches, students are engaged in activities where they must use the grammar rules or vocabulary they have learned. Teacher explanations of materials are kept brief in favor of students learning by doing. A flipped classroom approach supports active learning by moving the lectures and teacher explanations online. Using the tools listed above, teachers can create short grammar videos that explain the rule. Then in class, students can use what they learned in the video to practice the rule in context. For example, in a class learning the use of passive voice, the instructor can create a PowerPoint explaining passive voice and how it is used. This PowerPoint can be recorded as a movie file and posted online. Then before class, students watch the video. Here is a brief example of how the passive voice can be explained. This type of explanation can be given through a recorded presentation that students watch before class begins. Class can then begin with a short quiz on the content of the passive voice video followed by activities where students use passive voice. Students could spend class time creating English language pamphlets about a historical building in town or tourism videos to share online. The goal with these activities is for the students to engage in projects and language production using what they have already learned in the video and guided by in-class support from the teacher. This class could be followed-up with more online materials that support the students’ in-class activities. In this example, students worked in small groups making materials using passive voice. Questions asked by the small groups during class could be collected and then answered online. The instructor could answer students’ questions in a podcast recorded with Audacity. Students could then listen to the podcast as an after-class homework activity. To learn more about Audacity, visit the September 2015 Teacher’s Corner.